Volvo Trucks company, owned by the Volvo Group, is based in Gothenburg, Sweden and employs more than 52,000 people worldwide. Volvo Trucks company constructs and sells around 200,000 units annually. The Volvo Group is also the parent company of Renault Trucks (France), Mack Trucks (USA) and UD Trucks (Japan). The first Volvo truck was manufactured in 1928 in Gothenburg as a medium-duty vehicle named Series 1. It was equipped with 2-litre 4-cylinder engine rated at 28 hp (21 kW) and offered official payload of 1,500 kg (½ of its GVW). Today’s Volvo global product range consists of Volvo FH and FH16 (heavy-duty, long-haul), Volvo FMX (construction), Volvo FM (distribution, construction), Volvo FE (distribution, municipal) and Volvo FL (urban distribution). The first generation of Volvo FH16 was launched in 1993. Nowadays, the FH16 truck stays manufactured as its 5th generation, since 2012. Volvo FH16 is suitable for long-haul journeys, construction, heavy-duty transport (heavy construction and mining), simply for the most demanding missions. The FH16 truck is powered by D16K, Volvo’s most powerful engine. The D16K is a 16-liter engine rated at 550, 650 or 750 hp providing 3550 Nm. The maximum gross vehicle weight of Volvo FH16 is 56 t and the gross combined weight ranges from 44 to 120 tons. The FH16 truck is also equipped with Volvo I-Shift, intelligent and automated manual transmission with 12 forward gears and 4 reverse gears, designed to smoothen the driving and saving additional fuel. Volvo FH16 truck offers unique aerodynamic exterior and interior with high-quality leather (textile) details, features and specially designed panels. Volvo offers a wide choice of rear axles to customers. The strongest configuration is the 10x4 five-axle combination providing increased payload and greater flexibility, being optimal for concrete mixers, large cranes, fire trucks, sky lifts and other applications. Volvo offers the Low Sleeper, Globetrotter and Globetrotter XL cab types. Moreover, the FH16 truck is equipped with Volvo Dynamic Steering and the AEB system, using the combination of radar sensors and camera to prevent collisions (up to 70 km/h) thus enhancing the safety. The FH-series was introduced in 1993, when Volvo released the first generation of FH12 and FH16 trucks. Being produced for more than 25 years, the FH-series has become one of the most successful series ever, with more than 1,000,000 sold units worldwide. The “FH” means “Forward control High entry” and the number 16 stays for engine capacity in litres. Volvo FH trucks are suitable for long-haul transport, construction and even regional distribution and they feature fuel-saving cab design, individual front suspension or I-Shift Dual Clutch (intelligent automated manual transmission). The gross combined weight of Volvo FH trucks scales from 44 to 120 tons. The power is provided by D13K engines rated at 420, 460, 500 and 540 hp. These Volvo 13-liter engines are Euro 6 compliant. The customers can keep an eye out for these four cab types: Low Sleeper, Sleeper, Globetrotter and Globetrotter XL. Volvo also offers gas-powered FH LNG version (liquified natural gas). 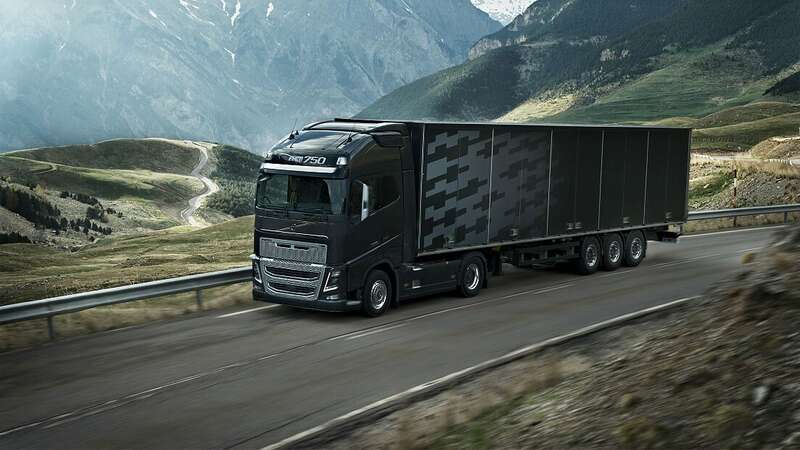 The FH LNG offers the same performance as a diesel-powered truck. Moreover, it consumes 20% less emissions than regular FH truck and when fuelled by BIO-LNG, emissions can be reduced by 100% (“tank to wheel” emissions). Customers can choose between 420 and 460 hp G13C gas (LNG) engines. The first FMX truck (“Forward control Medium Xtreme”) was launched in 2010 as a model related to Volvo FM series. The current FMX version has been manufactured since 2013. 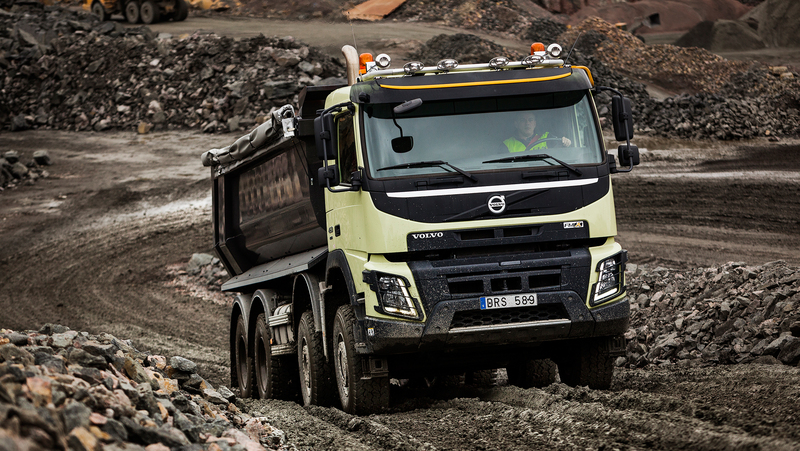 This Volvo series was designed for construction transport, to make it safer and easier. The FMX is made of strong materials as it is the most robust Volvo truck capable of carrying large loads. It also features sturdy bumper, comfortable rear suspension and advanced steering. Volvo FMX offers 4x2 to 6x6 tractor and 4x2 to 10x4 rigid drive configurations. The most popular configuration is Volvo FMX 8x4 with twin front axles. To perfectly match the construction transport needs, customers can choose from many customization options such as tridem rear air suspension with ground clearance of at least 300 mm (being able to handle rough terrain while protecting both cargo and truck), steerable tag axle, dual front axles, Auto Traction Control (for 4x4 to 10x6 driven front axle configurations), Volvo Dynamic Steering (easier to maneuver, fuel savings) or I-Shift gearbox. Volvo FMX trucks can be powered either by 11-litre D11K (330, 380, 430, 460 hp) engines or by 13-litre D13K (420,460, 500, 540 hp) engines, both of them being Euro 6 ready. Volvo FMX trucks are compatible with the Day, Sleeper, Globetrotter and Crew cab types. The FM is Volvo’s most versatile heavy truck with striking urban design, improved handling and operating economy. It is a multi-purpose specialist that can be modificated as a tipper, tanker, transporter or crane, being designed for distribution, construction and highway/off highway transport. Volvo introduced the FM truck in 1998 as FM7, FM10 and FM12 models. The current FM model has been manufactured since 2013. FM acronym stays for “Forward control Medium height cab”. Therefore, Volvo FM shares some features with Volvo FH truck, but they primary differ in cab positions (FM has lowered cab). The gross combined weight of Volvo FM ranges from 44 to 120 tons, depending on configuration. Volvo FM trucks are powered either by D11K engines rated at 330, 380, 430 and 460 hp or by D13K engines providing 420, 460 and 500 hp. The FM trucks are compatible with Day, Low sleeper, Sleeper, Globetrotter and Globetrotter XL cabs, which are designed to be maximally comfortable. Moreover, customers could appreciate Volvo Dynamic Steering for optimal handling and the I-Shift intelligent manual transmission. Volvo also offers the LNG FM truck version, producing 20% less CO2 emissions than standard FM model. Volvo FM LNG is powered by G13C gas engine (Euro 6) rated at either 420 or 460 hp. Volvo offers 5 possible FM LNG configurations: Tractor 4x2, 6x2 Pusher, Rigid 4x2, 6x2 Tag and 6x4 Air. The operating range of FM LNG truck is up to 1000 km, depending on model. The first generation of Volvo FE trucks was launched in 2006. The redesigned second generation (actual) has been manufactured since 2013. Volvo FE trucks are easy to load and unload as they are primarily designed for regional and city distribution with a focus on maneuverability, visibility and productivity. Nevertheless, the FE trucks can be used in light construction, waste and recycling transport as well as refrigerated transport. The gross combined weight of Volvo FE trucks ranges from 44 to 80 tons and the gross vehicle weight is either 18 or 26 tons. The FE trucks are powered by 8-litre 6-cylinder D8K engines rated at 250, 280, 320 and 350 hp, Euro 6 compliant. These engines provide low-speed handling, fast acceleration and great pulling power. For city operations, Volvo offers the CNG engine (Compressed Natural Gas) rated at 320 hp, producing 15 % less carbon emissions than standard FE truck. As “safety first” is Volvo’s main FE concept idea, it offers a range of secure cabs including the Day, Comfort, Sleeper and Low entry types. The FE trucks are also equipped with intelligent Volvo I-Shift automated manual transmission and ESP (Electronic Stability Program), helping to keep the truck on the road. 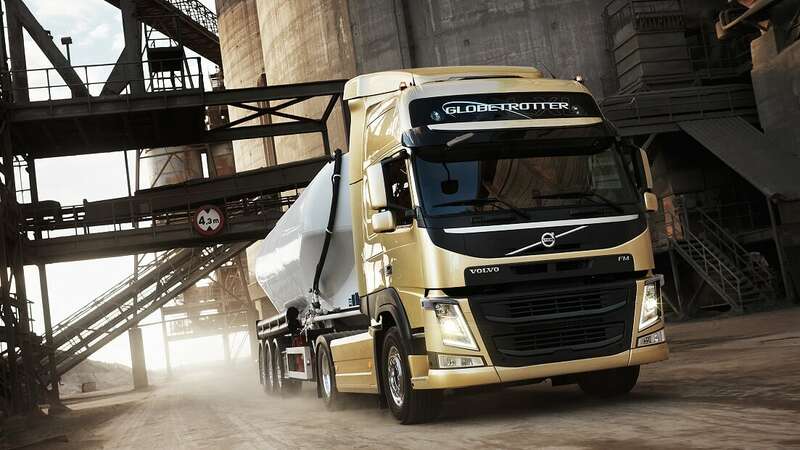 The FL is the smallest Volvo truck with compact and aerodynamic design. The first generation was launched in 1985, second generation in 2006 and the third (the most recent) in 2013. The FL stays for “Forward cab” and “Low-level cab”. The combination of productivity, maneuverability, safety, visibility, lightweight construction and agility makes the FL truck optimal for urban distribution, where it deals with heavy traffic, narrow alleys and short stops. Nevertheless, Volvo also offers the 4x4 drive version with higher ground clearance for tougher road conditions, suitable for light construction. The gross combined weight of Volvo FL scales between 19 and 40 tons and the gross vehicle weight ranges either from 12 to 18 tons (FL8) or from 10 to 16 tons (FL5). Regarding the equipped engine, we can divide the FL models into FL5 and FL8 trucks. Volvo FL8 models are equipped with stronger 8-liter 6-cylinder D8K engines rated at 250 or 280 hp and Volvo FL5 models are power by standard 5-liter 4-cylinder D5K engines rated at 210 or 240 hp. Both engines meet Euro 6 emission standards. Volvo FL trucks are also equipped with 6-speed I-Sync automated/full automatic gearbox. Volvo offers the Day, Comfort and Crew cab types for FL trucks, each of them being ergonomic and spacious. Moreover, the FL trucks use new technologies such as the ESP (Electronic Stability Program) and the LKS (Lane Keeping System) for smoother and safer ride.